Author: Martin Malden Published: November 19, 2015. Last updated: April 10, 2019. I described the difference between posts and pages in WordPress back here. Although they function differently, the process of writing a post is exactly the same as that for writing a page. For the purposes of this article, therefore, I will use the term ‘page’ throughout, but the process will be exactly the same for posts. The first thing you need to know is that you can write your page from scratch in WordPress or you can create it in MS Word (or any word processing package) and then copy and paste it into WordPress. I always use the second option (create it initially in Word) simply because the grammar and spelling checker in Word is better than that in WordPress. The choice is yours, but the process I have set out below follows my approach. 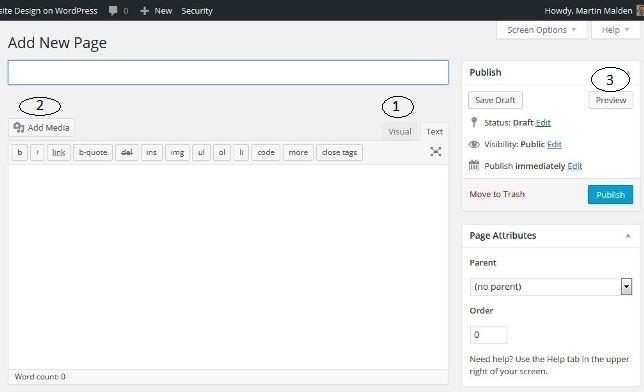 Before you start it’s worth taking a look at the WordPress new page screen, so you’re comfortable with the functions it offers. Firstly make sure you’re using the ‘Visual’ view (1). This will enable you to write and edit your page as if you were using a normal word processor. The ‘Text’ view displays the HTML code and, sometimes, some styling code. Unless you’re familiar with HTML and CSS I’d advise you to stay with the Visual view. In the Visual view make sure you have 2 rows of formatting buttons visible. If not, click the button at the right end of the row that’s visible. It will say ‘Kitchen sink’ when you hover your mouse over it. The formatting buttons will look very familiar to you if you use a word processing package, but hover your mouse over each to see the description of its function. Finally, these steps are for when you are using a standard page layout on your site. If your site uses a non-standard layout then you will need to insert your content through the ‘Text’ view, which means getting involved with the HTML and CSS. When the image has uploaded make sure it’s selected and then define its properties from the area on the right of the media gallery: the title helps you to find the picture in future in the WordPress media gallery, the caption is self-explanatory (but keep it short! ), the alt text tells the search engines what the picture is displaying, so describe that in a few words, then choose the alignment (left, centre or right). The remaining fields can be ignored. At this point your page is almost ready to be published but, before you do so, you should complete two more fields that will help your page appear as high as possible in the search results. The custom title tag equates to the blue heading in the search results, the one you click to go to a page. The Meta Description field equates to the snippet of text that appears under the blue heading in the search results. So, in the custom title field, type the page title in less than 70 characters. This can be the same as the title you wrote for the page earlier or you can tweak it slightly so it would look better in a search results listing. In the meta description field type a description of the page’s content in less than 150 characters. Now you can check ‘Preview’ again if you like and. If everything looks OK, click the ‘Publish’ button – and you’re all done. In separate articles (which I will link to when they’re ready) I set out how to complete these fields in the most effective way possible and the difference between the page title and the custom title. It would be worth reading both articles because they describe further refinements on how to make your page appear as high as possible in the search results and get people to click through to it.